Deploying tools in bioinformatics and computational chemistry to standardize, analyse and store nanobiotechnological information has gained rapid prominence after the discovery and application of DNA genomics in therapeutics. The current and traditional principles of nanobiotechnology, together with bioinformatics and analytical computational chemistry have converged into an exciting biomedical field called nanoinformatics. This review looks at this emerging sub-discipline of nanoinformatics and its intersection with nanobiotechnology in medical science in general. The medical applications of information systems sciences (i.e. informatics) have gained prominence as essential sciences in nanobiotechnology research, and have become particularly suitable in generating the appropriate research design frameworks. While these two concepts rely on computational and DNA analyses as well as protein sequencing, nanoinformatics specifically relates to the characterization of particles with applications in nanobiotechnology using strategies in computational and analytical chemistry. The introduction and application of contemporary information science techniques in solving problems in nanobiotechnology is likely to accelerate the discovery of tailored treatments, markedly reduce their side effects, and generally enhance their therapeutic efficacy. The conglomerate of these varied advantages has precipitated the concept of nanomedicine, which has also advanced exponentially in recent years. The discussions below will look at the convergence of nanobiotechnology and nanoinformatics by dissecting the disciplines into key thematic areas, followed by a discussion of the challenges, applications and future prospects in empirical nanobiotechnology and bioinformatics. Nanomedicine today has branched into various sub-disciplines, with a focus on manipulating nanosized structures at the molecular level, all geared towards deriving new and more benefits to medicine.1 These sub-disciplines have primarily focused on monitoring and evaluating the myriad of emerging methods for drug administration and treatment.2,3 The exponential generation of nanoscale data have also enabled multiband interdisciplinary disciplines to harness skills in creating new nanoparticles with relevant biomedical applications. The generation of this data, however, demands a thorough analysis, not only of their physicochemical properties, but also extensive structural characterization,2 requiring massive input and utilization of computational skills and resources. 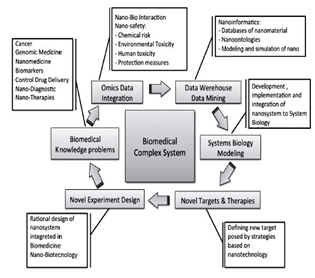 Figure 1 Schematic illustration for the convergence of different nanoscale disciplines and sub-disciplines from biomedicine to nanobiotechnology in a biomedical system. During the early stages of nanoscale project development, a computational approach comes in very handy. As a powerful technique, it can be used in designing transport systems for drugs and molecular devices.3 In recent years, the stoichiometry of new nanomaterials has been successfully utilized in conjunction with the increasing use of computational molecular design techniques;9,10 this has been possible because of the increased capacity, and the convergence of a number of methodologies utilizing computational chemistry.10 Computational chemistry has also helped in the design, modeling and simulation, of nanomaterials,11 nanoparticles,12 metallic nanoparticles,13 nanospheres,14 nanocapsules,15 and quantum dots.16 These nanosized particles are currently being used as carrier for early diagnosis in nanomedicine.16 In modeling and simulation, the application of molecular dynamics requires an accurate characterization of the physico-chemical properties17,18 of the nanosystem, in order to obtain accurate results about the structural dynamics at the atomic level. Analytical computational mechanics can be deployed in determining the optimized structure of nanomaterials. This method uses a molecular model where spheres and springs depict inter-spatial atoms and bonds respectively.19 Hence, modeling at the nanoscale level requires accurate coordinates for both the organic and inorganic components of the nanostructures.18 These characteristics are extremely important in the 3-dimensional structural representation of nanostructures. Computational molecular chemistry also deploys quantum mechanics to predict the structure of nanomaterials, and to quantify the different descriptors that depend on the electronic nomenclature of the system.18 Notwithstanding the appropriateness of these methods, they are limited by the time required for the calculations .19 For this reason, quantum mechanics would require new methods or an adaptation of the traditionally used techniques in order to become relevant in contemporary nanoinformatics. Over the past 30 years, the different approaches in computational chemistry used for designing nanoparticles have been very diverse. For example, some earlier researchers have used modeling and simulation techniques to study the size, structure, and characteristics of nanoparticles.19 Such characteristics posit an essential role when deployed as carriers in systemic transport. Another classic example of advanced computational chemistry is the use of a biopolymeric membrane in designing a drug delivery vehicle .20 Overall, it seems reasonable to point out, that designing suitable nanosystems requires contemporary and analytical computational chemistry, or adaptation of the available traditional ones, in order to generate workable procedures or protocols. Freitas R. What is nanomedicine? Disease-a-Month. 2005;51:325–341. Farokhzad O, Langer R. Nanomedicine: developing smarter therapeutic and diagnostic modalities. Adv Drug Deliv Rev. 2006;58(14):1456–1459. Thierry B. Drug nanocarriers and functional nanoparticles: Applications in cancer therapy. Curr Drug Deliv. 2009;6(4):391–403. Gonzalez IA, González NF, Cachau R. The Collaboratory for Structural Nanobiology. Biophys Jnl. 2009;96:49. Milanesi L, Romano P, Castellani G, et al. Trends in modeling biomedical complex systems. BMC Bioinformatics. 2009;10(Suppl 12):I1. Escobar Rodriguez AM. NBIC–Nano, Bio, Info, Cogno the convergence of technologies. Cuba: Cuban Observatory of Science and Technology, Academy of Sciences of Cuba; 2008. Talbi E, Zomaya A. Grid Computing for Bioinformatics and Computational Biology. Wiley–Interscience; 2007. p. 47–50. Tentoni L. A model–based approach to the assessment of physicochemical properties of drug delivery materials. Computers and Chemical Engineering. 2003;27(6):803–812. Rickman J, Lesar R. Computational Materials Research. 2003;65(113):114–140. Gao H. Modelling strategies for nano–and biomaterials. In: Gao H, editor. European White Book on Fundamental Research in Materials Science. Germany: Max Planck Gesellschaft; 2001. p. 144–148. Selim W, Lee C. Bioinspired application of dendrimers: From bio–mimicry to biomedical applications. Prog Polymer Sci. 2009;34(1):1–33. Prasad K, Jha A. Biosynthesis of CdS nanoparticles: An improved green and rapid procedure. J Colloid Interface Sci. 2010;342(1):68–72. Lee H, Yang H, Holloway P. Functionalized CdS nanospheres and nanorods. Physica B: Physics of Condensed Matter. 2009;44(22):4364–4369. Fan D, Hao J. Magnetic aligned vesicles. J Colloid Interface Sci. 2010;342(1):43–48. Kang W, Chae J, Cho Y, et al. Multiplex imaging of single tumor cells using quantum–dot–conjugated aptamers. Small. 2009;5(22):2519–2522. Gates T, Odegard G, Frankland S, et al. Computational materials: multi–scale modeling and simulation of nanostructured materials. Composites Science and Technology. 2005;65(15–16):2416–2434. Shapiro B, Bindewald E, Kasprzak W, et al. Protocols for the in silico design of RNA nanostructures. Methods Molec Biol. 2008;474:93–115. Gates T, Hinkley J. Computational materials: Modeling and simulation of nanostructured materials and systems. 2004;2:1872–1876. Zhang W. Nanoparticle aggregation: principles and modeling. Adv Exp Med Biol. 2014;811:19–43. Sibeko B, Pillay V, Choonara Y, et al. Computational molecular modeling and structural rationalization. Biomed Mater. 2009;4(1):015014. Drexler KE. Nanotechnology: The past and the future. Science. 1992;255(5042):268–269. ©2015 Moffatt. This is an open access article distributed under the terms of the Creative Commons Attribution License , which permits unrestricted use, distribution, and build upon your work non-commercially.